Explanation: What's happening at the center of elliptical galaxy NGC 4696? There, long tendrils of gas and dust have been imaged in great detail as shown by this recently released image from the Hubble Space Telescope. These filaments appear to connect to the central region of the galaxy, a region thought occupied by a supermassive black hole. Speculation holds that this black hole pumps out energy that heats surrounding gas, pushes out cooler filaments of gas and dust, and shuts down star formation. Balanced by magnetic fields, these filaments then appear to spiral back in toward and eventually circle the central black hole. 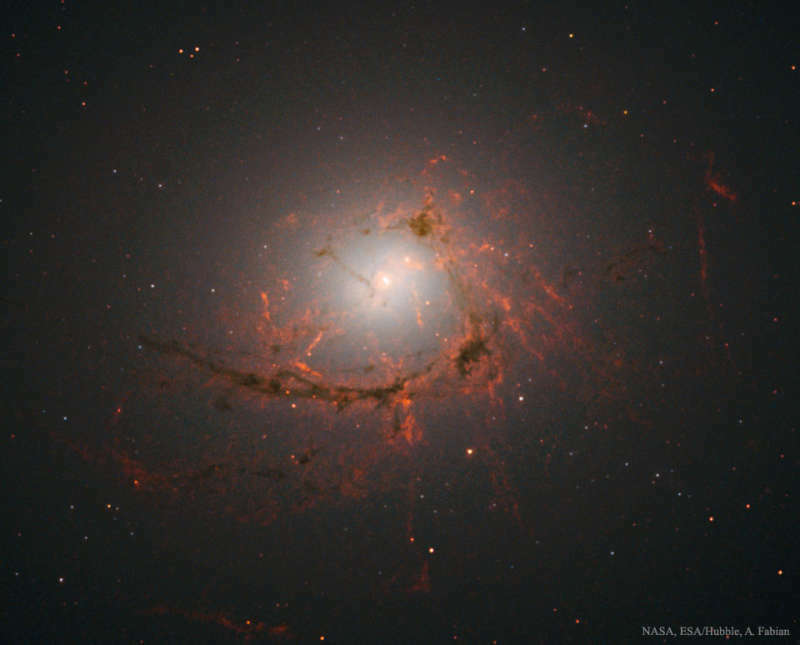 NGC 4696 is the largest galaxy in the Centaurus Cluster of Galaxies, located about 150 million light years from Earth. The featured image shows a region about 45,000 light years across.